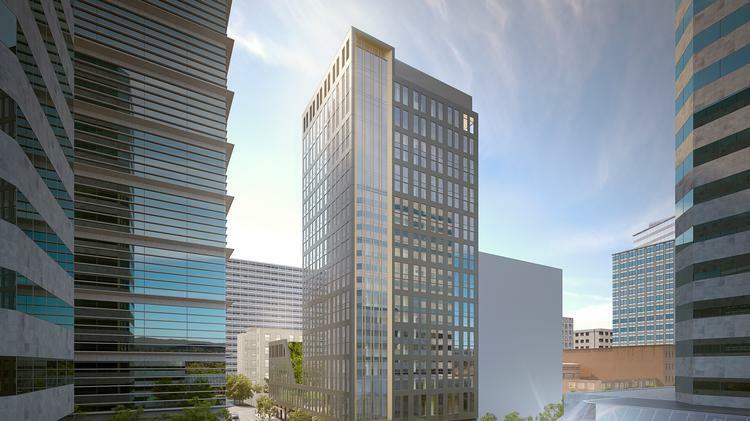 A 120-day demolition delay period has come and gone, and the developers behind a project that will add a 20-story hotel and a 10-story office building to a prime downtown property are moving ahead with their plans. Those include deconstruction of two well-known, old-time buildings on the the property bounded by Southwest Second and Third avenues and Southwest Taylor and Southwest Salmon streets. One, the Albion Hotel, is home to the Lotus Cardroom and Cafe, a storied bar and restaurant that has been open since the days of Prohibition. The other is the Ancient Order of United Workmen Temple, an old brick building that has been largely vacant save for some ground-floor retail operations for many years. According to Pat McCormick of AM:PM PR, T&T Development, which includes Jeff Arthur of Arthur Mutal and Jack Onder of Onder Development, submitted applications on June 30 to begin deconstruction of both buildings. Once permits are issued, deconstruction of the Lotus building and environmental abatement work will begin approximately 45 days later. That property is where T&T will build its 20-story hotel. About two or three months later, deconstruction on the Workmen Temple building and construction of the 175,000-square-foot office portion of the block will begin. The office building will include ground-floor retail, a rooftop terrace and two levels of underground parking. When T&T announced that it would be tearing down the Workmen Temple building, local preservation group Restore Oregon filed an appeal with the state Land Use Board of Appeals, but the group withdrew that after T&T voluntarily agreed to a 120-day delay period that would give the buildings a reprieve until at least April 30. In an earlier interview with the Business Journal, Arthur said T&T will make every effort to incorporate elements from each of the buildings, including the old bar from the Lotus, into the new development. Onder noted, too, that the current owner of the Lotus has expressed interest in being involved in the new development, either as the Lotus or possibly another restaurant or bar. A notice posted on the Workmen Temple building at Southwest Third Avenue and Southwest Taylor Street notes that a meeting with the Design Commission is set for 1:30 p.m. Thursday, Aug. 4. The meeting will address minor modifications to the roof area and bike parking. Located at 120 NW 10th Ave in the Pearl, Penzey’s Spices is the perfect place to purchase a gift for the chef in your family. They offer gift boxes full of heavily used spices, including: cinnamon sugar, pasta sprinkle and taco seasoning.